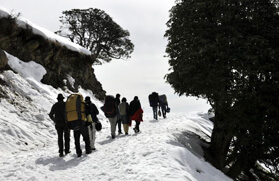 One of the most beautiful treks in Himachal Pradesh that engrosses the mind of travellers, the Sepherd trail, locally known as Gaddi trek, connects the rich and pictorial valley of Kullu with Kangra valley. The journey stretches from an elevation of about 2,050 meters to 4,800 meters. 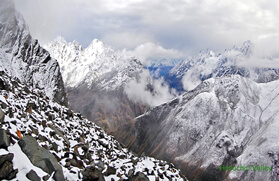 The highest point on this trail is the Kalihani pass at an elevation of 4,800 meters. The journey traverses through several other high altitude mountain passes, namely the Khanpari pass at 3,600 meters and Thamsar Pass at 3,500 meters. The Gaddi Trek, which is one of the alpine treks in Himachal Pradesh, passes through numerous shepherd villages and grazing cattle farms tucked high in the mountains. The trail is enriched by several alpine woodlands and meadows, wild animals and colourful orchards and gushing streams. Filled with adventure and cultural grandeur the journey becomes more strenuous when coming in contact with the tricky and slippery glaciated tracks. Moreover, the silver spectrum of the Himalayan range that forms a crest parallel to the spotless blue sky simply is a treat to the eyes. The pristine waters of the lakes reflecting the surrounding mounds and spectacular view of the Dhauladhar range further makes the trail worth the strenuous walk. 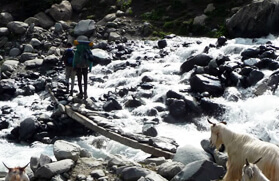 The shepherd trek commences from Manali at 2,050 meters and leads to Lamadugh at about 2,500 meters. The journey passes through several streams and a thick forest of cedar trees. 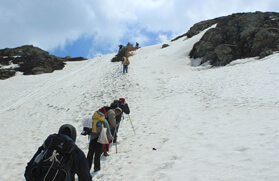 From Lamadugh the trail heads upward with a steep climb to Dohra Nalla at 3,100 meters and crosses the Khanpari pass. Thereafter, the trail embarks up on the moraine tracks and passes through a lush green forest to the base of Kalihani at Sangohar, which is at an elevation of 3,800 meters. The shepherd trek from this point turns out to be strenuous as it climbs up a steep and elevated stretch to Kalihani Pass and follows a gradual descend to reach Gaddi Gote at 3,600 meters. The journey then leads to Lamba Phad at 3,300 meters via Devi Gote and along the bank of Soony River. You will come across a small temple constructed by the shepherds. From Lamba Phad to Soony the path winds through rocky terrain and ascends gradually through a thick forest. The shepherd trek continues to head towards Bara Bhangal at 2,540 meters and there again it follows a steep ascend to Thamsar Pass. Slowly the journey steps on to a different terrain as it leads to Panihartu at 3,200 meters and thence moves down to Raj Gundha at 2,900 meters. The route then descends through a thick forest of oak and rhododendron towards Bir at 2,080 meters and one can get enchanted by the panoramic view of the Kangra valley. From Bir the shepherd trekking tour in Himachal Pradesh finally ends at Dharamshala. The shepherd trek being one of the longest trekking tours in Himachal Pradesh and covering different elevations every day requires some serious acclimatization after reaching certain altitudes. Fitness is of utmost importance and hence it is recommended for trekkers having proper knowledge of trekking and having prior experience of high altitude trekking. A steady climb to the camp site: the scenery changes there quite dramatically while the air became cooler. The cill of the evening is replaced with the comfortable warmth of a lively campfire. A very pleasant walk through a leafy bridle path meadows forest and the cascading waterfall; soon, the tiny village makes appearance literally hanging on the shoulders of the hill side, giving them a magical, surrealistic appearance. On the way visit the Tibetan settlement and the monastery at Bir, Chamunda Devi temple in Palampur. After driving 50 km., reached at Dharamsala. Dinner and overnight stay in hotel. After breakfast half day sight seeing tour of Dharamshala & in the evening transfer to Pathankot railway station to catch train for Delhi. Overnight journey. Arrive Delhi by morning and then transfer to hotel for relaxes. In the evening transfer to airport to catch flight for onwards journey.